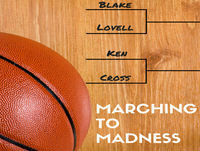 In this episode of Marching to Madness, hosts Blake Lovell and Ken Cross preview the South Region in the 2019 NCAA Tournament. Topics of discussion include: analysis for each first round game, the most anticipated matchups, which teams could play the spoiler role and make a Cinderella run, how many teams could realistically win the region, who will advance to the Final Four, and much more. It’s another exciting episode of Marching to Madness! Ken Cross has a plethora of experience over a 20-plus year period in both print and broadcast journalism. He has worked in some capacity for ESPN Radio, CBS Sports Radio, Fox Sports Radio, Sporting News Radio, Yahoo! Sports Radio and many more. This includes coverage of college football, college basketball, Carolina Panthers, Charlotte Hornets/Bobcats, and the Carolina Hurricanes. His print and internet experiences include a college basketball writer and internet writer for Lindy’s Sports Annuals and www.lindyssports.com, Blue Ribbon College Basketball Yearbook, and Rivals.com. He’s the founder and editor of collegehoopswatch.com. You can follow him on Twitter @KennyBuckets333.